This self-catering holiday home is a restored 19th century farmhouse standing on a hill overlooking an attractive valley. It has a sunny south-facing courtyard flanked by two large barns and the 1.5 acre plot includes garden areas with a variety of fruit trees including apple, plum, fig, damson, mirabelle, quince and walnut. Below the small meadow is a large 12m x 6m fenced swimming pool with a self-closing gate. The house is spacious and comfortable, with a very large family kitchen, and is amply provided in every way (bedding, kitchen machines and utensils, TV, music players, games, WiFi etc.. The aim is to ensure that our guests have everything they need, that everything in the house works properly and is of high quality. If you like peaceful countryside, good food and wine and bustling French markets, start here! Angouleme, Brantome, Cognac, Perigeux and all the great wine-growing areas around Bordeaux (of which St Emilion is probably the most attractive) are easy to reach by car. The Atlantic coast is less than 2 hours drive away; and the caves of the Dordogne are about an hour and a half away -a marvellous trip for a rainy day. Also within easy reach there are plenty of tennis courts, and rivers and lakes to swim or fish or boat in. Golf: There is a 9 hole golf course in an attractive leisure complex about 15 minutes away which also has tennis courts and a swimming pool. Perigueux (40 minutes) and Cognac (50 minutes) also have very good 18 hole courses. Two washing machines are provided. In addition to the large kitchen refrigerator, there is a fridge-freezer and a third refrigerator in the adjacent barn. Crockery, cutlery and kitchen equipment are sufficient for 10+ people. A full set of golf clubs is provided and there are additional, older but serviceable, clubs sufficient to make up a second set. The swimming pool is fenced and has a regulation self-closing gate. 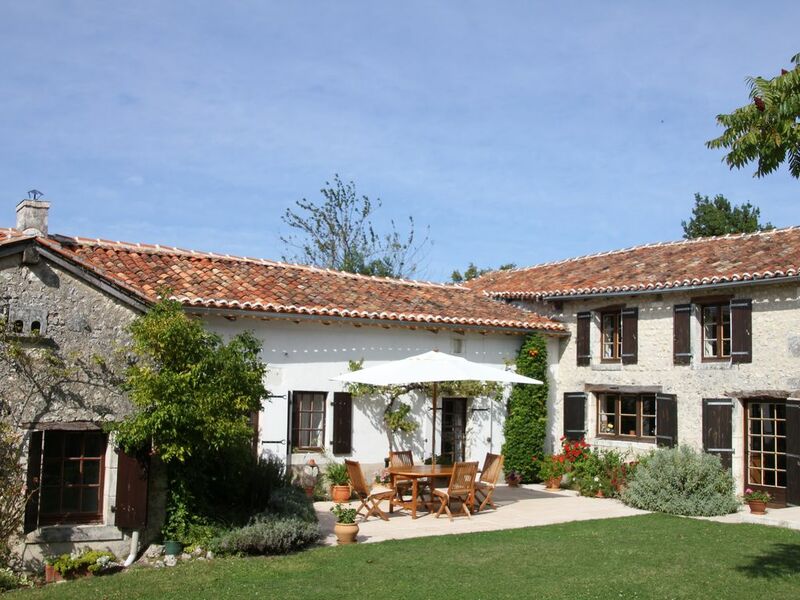 This farmhouse property is situated in peaceful and very attractive countryside mid-way between Angouleme and Perigueux. Driving times from Bordeaux and Bergerac airports are about 80 minutes and 70 minutes, respectively. Driving time from Calais is about seven and a half hours (450 miles). Other Activities: Golf, tennis, canoeing (on the river Dronne).